When a business plans to mark parking spaces for their parking lot, it must provide van accessible parking spaces as required by the ADA Standards for Accessible Design. One in every six accessible off-street parking stalls, but not less than one, shall be served by an accessible aisle of (8'-0") minimum width and shall be assigned as van accessible. The R7-8b sign shall be mounted below the R99B (CA) plaque or the R99C (CA) sign. In California, the VAN ACCESSIBLE (R7-8b) sign shall be mounted below the Accessible Parking Only (R99(CA)) sign in combination with MINIMUM FINE $250 (R99B(CA)) plaque; or, Accessible Parking Only Minimum Fine $250 (R99C(CA)) sign of the parking space for persons with disabilities designated as the van accessible space as provided in the California Building Code Section 1129B. 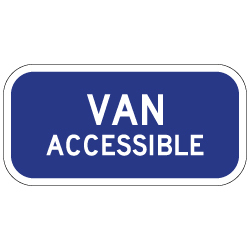 DOUBLE the working life of your Van Accessible Handicap Parking Signs by adding 3M Protective Overlay Film (POF)! 3M’s high-tech POF protects sign faces against fading caused by the sun and harsh weather—and makes graffiti and sticker defacement damage easy to clear away without harsh abrasives.